Bernie Sanders is socially liberal and fiscally Catholic. This isn’t the first time that Sanders has described the pontiff as if he were an unofficial economic adviser. Back in February, Sanders went so far as to describe Francis as a fellow socialist. 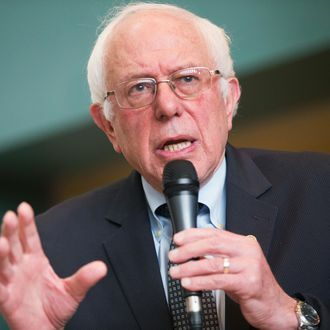 Whether or not the pope shares the Vermont senator’s enthusiasm for Eugene Debs, he’s “feeling the Bern” enough to have invited the Jewish presidential candidate to speak at the Pontifical Academy of Social Sciences, during a conference on social, economic, and environmental issues. Or, at least, he’s enthused enough to have let Bernie invite himself. On Friday afternoon, the president of that Pontifical Academy threw a great oak tree’s worth of shade at the Democratic candidate. Late Friday, a senior Vatican official told Reuters that Archer was mistaken. Monsignor Marcelo Sánchez Sorondo told the news service, "This is not true and she knows it. I invited him with her consensus." One thing Sanders probably won’t be bringing up at the Vatican: Hillary Clinton’s emails. But he did bring them up on Friday’s Morning Joe, in order to make a point about how he never brings them up.